Right now, I’m attending the 2012 Congress of the Naval Order of the United States, a venerable (founded in 1890) organization dedicated to the preservation and promotion of U S Naval history. The Congress venue is located in Baltimore’s Inner harbor area, an attractive collection of museums, hotels, eating establishments, shopping and historic ships open for touring. Sick Bay aboard USS Constellation. Baltimore MD. This afternoon, we had some time off from our program of talks (largely about the War of 1812), so I walked the USS Constellation. As you might imagine, I was particularly interested in how the ship’s medical spaces were portrayed and displayed. Located in ship’s bow, a level below the gun deck (two decks below the weather deck), the surgeon’s pit was quite a bit more spacious than I would have imagined. I’m not sure the photo here gives a good perspective, but here it is. 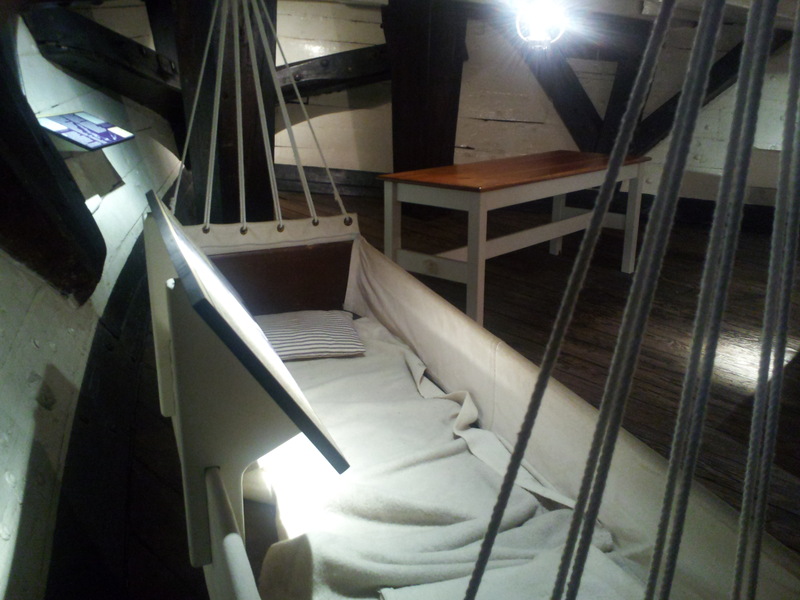 In the foreground you see a box-like bunk for a sick sailor (much more comfortable, one presumes, than the usual hammock), and in the distance you see a table where, presumably, the ship’s surgeon plied his trade. The recorded commentary for the sick bay told that the Assistant Surgeon, Clark – attached to the ship during the Civil War – could amputate an arm in less than a minute. This fact was presumably reassuring to the ship’s crew members! A glass front storage cabinet had on display a set of very sharp-looking amputation knives. I didn’t see any bone saws on display but presumably, if one of the surgeon’s went dull, he had only to call out to the next deck below – where the carpenter worked – for a sharp replacement. The commentary also pointed out that the quality of Civil War Naval surgeons was better than the Army’s because the Navy had a system of rigorous exams that candidate surgeons had to pass in order to receive their Naval commissions. I recall that the topics covered in these exams ranged from anatomy and physiology to obstetrics and gynecology to medical jurisprudence. And the pass rates for candidates graduating from the (now) Ivy League schools was not particularly high. 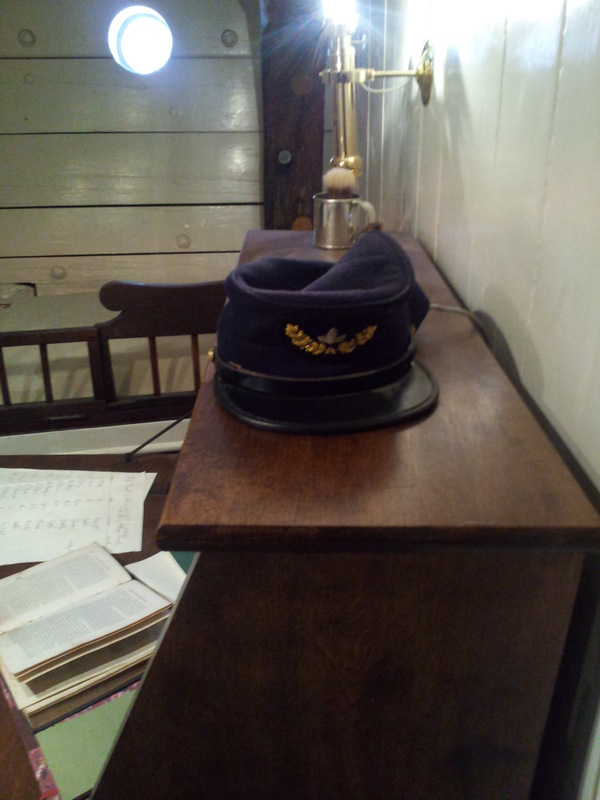 Surgeon’s Cabin: his cover on his desk, bunk behind. “Officers’ Country”, where the ship’s commissioned officers lived and slept is located in the stern of the ship on the same level as the sick bay. Arrayed on either side of a spacious central gathering and eating space were the officers’ cabins – those of the line officers (the ship’s Executive Officer and lieutenants) to starboard, the staff officers (purser, surgeon, chaplain) to port. The ship’s dispensary, a small space located to starboard between Officers’ Country and sick bay was where the surgeon’s steward mixed and dispensed drugs. Much drug treatment was termed “heroic medicine” – purgatives to clear bad fluids and discharges from the body. A few truly effective medicines were available though: quinine for “fever” (especially, of course, fever of malarial origin) and mercurials, which, if used judiciously, might be useful in treating syphilis, if over-prescribed, could kill a man with mercury poisoning. The derivation of the term the ship’s “head” (bathroom) in a sailing ship became quite clear on tour in Constellation: all crew members except the Captain (who enjoyed the pleasure of a private head – and a bathtub) had almost to climb the bowsprit at the very front of the ship to do their business. And this never occurred to me before: since the wind was coming from behind the ship, it would in fact blow the waste away, ahead of the ship. And, as the commentary noted, copious sea spray helped keep things pretty clean up forward. One other observation: the smell below decks in Constellation reminded me of the smell in the aging caves in California wineries. I think it’s the smell of the oak used to make ships and wine barrels. And another thing: the decking timbers is least an inch and a half thick. They were pretty generous in their use of that oak, back in the day. Great post! I think we can thank, in part, the recommendations of Dr. Edward Cutbush, of Barbary War fame, for the quality of Naval Surgeons. He strongly recommended examinations for newly accessioned doctors.